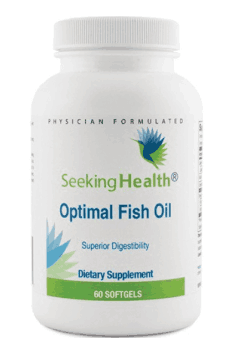 Seeking Health Optimal Fish Oil is the highest quality composition of omega-3 fatty acids from fish which are multidirectional support for health. The product is enriched with lipases, enzymes which facilitate digestion and bioavailability of fats. The supplement is characterised by the highest quality of its composition. Rival products offen contain small amounts of omega-3 acids in 1 g of fish oil. We offer you the highest concentration of DHA and EPA acids – 1,000 and 500 mg per serving (2 capsules). Moreover, the acids are present in their natural, triglyceride combination, which ensures the highest absorption from the digestive system. The bioavailability of the acids is improved by the addition of lipases which not only enhance their absorption but also prevent negative reaction of the digestive system, such as belching characteristing for the supplementation with fish oil. The common problem among supplements providing fish fatty acids is their polluted composition, especially with heavy metals coming from pollution in seas and oceans. This is why the supplement manufacturer decided to obtain the oil from anchois and sardines caught off the Peruvian coast. Moreover, to keep maximally pure composition, the oil underwent molecular destilation which got rid of any pollution without loss to the quality of the product. Unsaturated omega-3 fatty acids contained in the product are characterised by multidirectional action because of the unique mechanism of their metabolism. They can be the part of the lipid bilayers which surround each cell of the body system. They compete over a place with proinflammatory omega-6 fatty acids consumed in excessive quantities by many people. The perfect relationship between omega-3 and omega-6 acids is 1:1, while in a diet of an average European it is around 1:30. Moreover, omega-3 acids are able to modify expression of particular genes. The main advantage of the omega acids DHA and EPA, responsible for their multidirectional effects, is the ability to reduce inflammations. What is important, the effects result from many mechanisms. One of them is reduction in proinflammatory action of omega-6 acids, consumed in excessive quantities, resulting from inhibiting the activity of C-reactive protein. Moreover, DHA and EPA reduce the amount of interleukin 2, which stimulates the development of cytotoxic lymphocytes T and NK cells. Omega-3 acids reduce also gene expression of proinflammatory cytokine TNF-α, which is associated with development of autoimmune diseases and cancers. Supplementation with fish oil contributes to the reduction in inflammations, also due to reduction in enzymes involved in inflammation development. They also act here at the stage of protein gene expression, which is why they inhibit the synthesis of such compounds as induced cyclooxygenase and lipooxygenase. Moreover, eicosapentaenoic and docosahexaenoic acids are precursors for the production of protectins and resolvins. These compounds have specific receptors on cell membranes which suppress inflammations. A characteristic of nerve cells is the presence of large amounts of DHA in cell membranes. The acid is responsible for liquidity essential for their proper functioning. Depolarisation of neuron cell membranes is the basic mechanism of nerve conduction, which is why their efficiency determines the proper functioning of the whole system. Omega-3 acid deficiencies in diet result in decline in mental capacity, impaired perception of stimuli and motor coordination. Supplementation with fish oil is also an effective form of prevention of neurodegenerative diseases. Moreover, it has been demonstrated that children whose diets from the beginning included bigger amounts of DHA and EPA acids achieved better results in IQ tests. Omega-3 acids have similar influence on cardiomyocytes, whose unique characteristic is the ability to self-stimulation and impulse conduction, which are the only mechanism determining heart functions. In this way, supplementation with DHA and EPA prevents cardiac arrhythmia and contraction disorders whose main symptom is hypertension. Studies demonstrate important corelation between omega-3 acid supplementation and smaller risk of coronary artery disease. Fish oil can also balance the lipid profile. The supplementation has such beneficial influence on the triglycerides level, that it is often recommended instead traditional pharmacological measures. Moreover, omega-3 acids contribute to the increase in the concentration of HDL lipoprotein (the so called “good” cholesterol) and positively affects the relationship between HDL and LDL levels, which is one of the main indicators of the condition of the cardiovascular system. The supplementation with eicosapentaenoic and docosahexaenoic acids is also effective in the treatment of depression, including postnatal depression. DHA acid can also reduce symptoms of schizophrenic disorder. Moreover, supplementation with fish oil is indicated to be an effective measure in the treatment of bipolar disorder and ADHD in children. To sum it all up, EPA and DHA acids are essential for the proper functioning of all cells of the human body system, and increasing their supply bring many benefits both for the general improvement in the body system functions and for the prevention of various disorders. Optimal Fish Oil is a dietary supplement which provides the best bioavailable forms of eicosapentaenoic and docosahexaenoic acids of natural origin, without any risk of burdening the body system with heavy metals, pesticides and any pollution characteristic for aquatic organisms. In case of a diet rich in omega-6 fatty acids, it is worth to increase the supplement dose up to 6 capsules a day, which will provide the amount of 4.5 g of pure omega-3 acids. People with high cholesterol level should be particularly careful during supplementation with DHA and EPA acids. In such case, it is recommended to increase the dose gradually and check regularly on the lipid profile. Natural lemon flavor, lipase, mixed tocopherols; bovine gelatin, glycerin, water, and annatto (natural color) (softgel ingredients). Natural flavor derived from lemons.